The Annual General Meeting was held in Wellington on 14 August 2013. 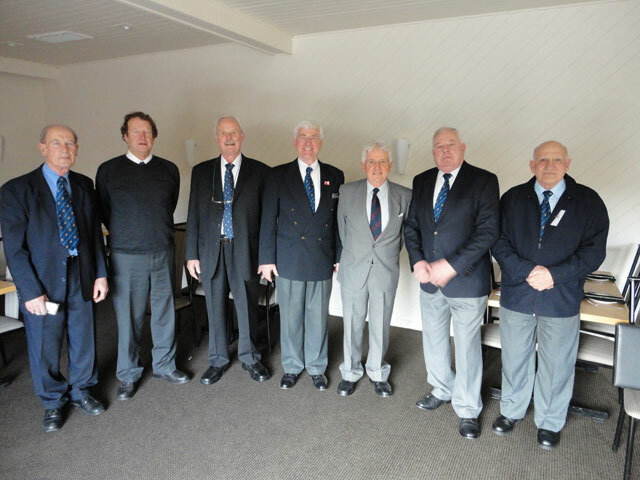 L – R : Captain Cor van Kesteren (General Secretary), Captain John Frankland(Auckland Secretary), Captain Tim Wood (Tauranga Warden), Captain Ted Ewbank (Auckland Warden), Captain Ken Watt (Master), Captain Ron Palmer (Wellington Warden), Captain Nic Campbell (Hon On Deck Editor). This entry was posted in Executive Committee. Bookmark the permalink. My name is Sara Andrews. I am Andrew Amos’s daughter. I am trying to get hold of contact details (email) for Tim Wood who I believe is my Father’s cousin. Tim visited my parents in Harbour Court, Bosham, Chichester, UK a few years ago apparently, but I only have a postal address for Tim. I would attach photos of my parents so he knows this is genuine, but I can’t see how to – maybe its not possible. Will endeavour to contact Tim Wood, and if successful he hopefully will email you.